This Super Soft Buff Powder Brush is the ideal follow up to Blush & Powder Brush – the flat surface being perfect for sweeping over your finished face, to blur any edges and achieve a flawless, airbrushed effect. The flat bristles swept in a circular motion blend product seamlessly for a naturally gorgeous make-up look, or can be used to buff blusher for a lit-from-within luminosity. It’s also brilliant for sculpting/highlighting – being firm enough to work product over a specific area (such as cheekbones) to enhance the contours of your face with perfectly blended light and shadow. Kevyn Aucoin’s range of professional products and tools captures the wisdom and creativity he applied throughout his career at the forefront of the beauty industry, so the woman at home can make up like a make-up artist. Firm in his belief that cosmetics should enhance – not detract – from one’s natural beauty, everything from his skin perfecting primers to super-soft, goat hair brushes are engineered to perfect skin, beautify eyes and define contours without any obvious artifice. 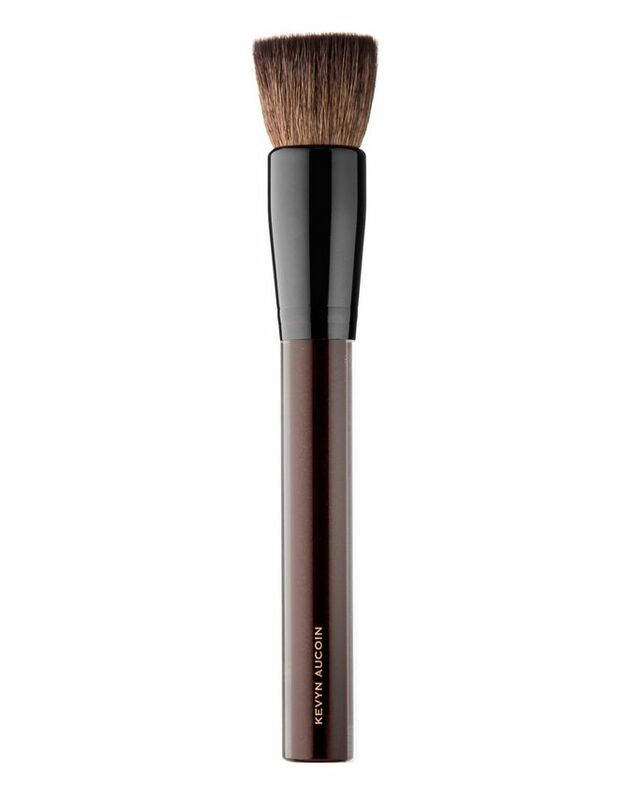 His Super Soft Buff Powder Brush is a make-up bag must-have and ideal for use with his Sculpting Powders and Bronzing Veils. Load the brush with powder, applying to the face in a circular or sweeping motion Use to 'soften' finishing make-up - blurring any edges for a flawless, airbrushed finish. I was a little sceptical about the price but wanted a good quality buffing brush. All of the KA products I have bought in the past have been spot on! These include the Candlelight powder & Creme, Sculpting Contour Powder & Creme, Celestial Liquid Highlight, Mascara, Eyelash curler, Creme Blush Duo and Lipsticks. I have yet to be disappointed & this brush is no exception. It's very soft & has the perfect proportion of denseness & softness which I find perfect when I need to blend in all the harsh edges after all my makeup is applied. It makes the powders, bronzers, highlighters all blend seamlessly looking ethereal and lit from within. I also use it to pat on my pressed powder before I use it in soft circular motions all over my face to seamlessly blend in all my makeup. Definitely worth the price as it does the job perfectly, feels & looks good, very versatile, fantastic quality & if looked after will last a lifetime !